A stars and stripes cake for a Kiwi-American birthday celebration in good old NZ. The family provided me with the lovingly baked the fruit cake, which smelled just divine! My job was to ice it with an American theme. 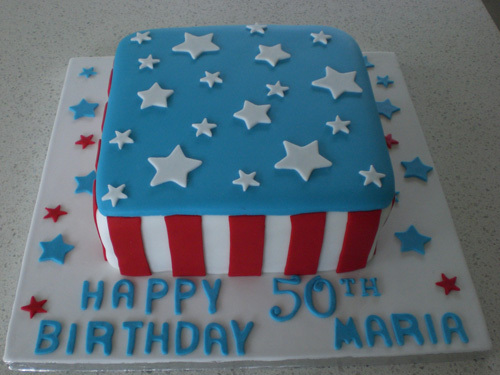 It had an almond then fondant icing layer with fondant stars and stripes. Turned out very 4th of July looking. 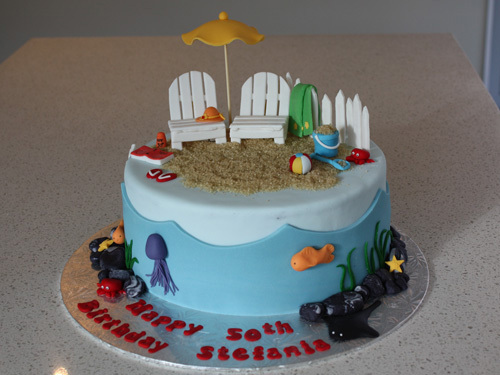 I made this cake for one of the other Nana’s 50th birthday celebration. 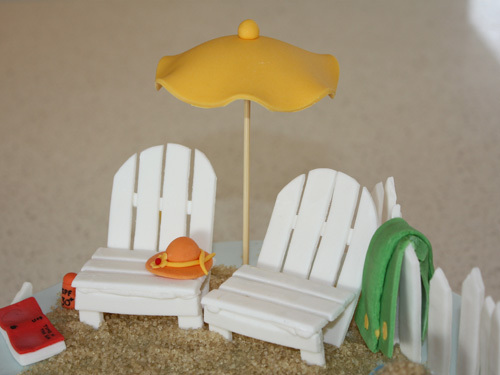 This beach scene includes all the things you need for a relaxing day at the beach. The cake is chocolate with a chocolate ganache filling, then covered with fondant. 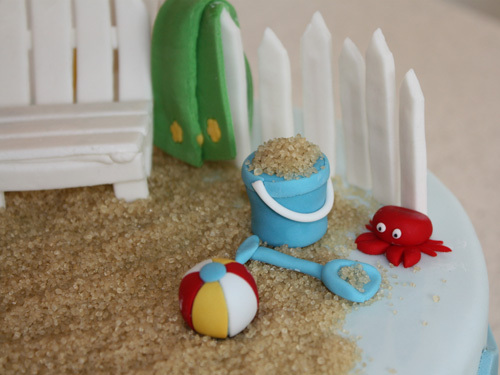 The beach items are all fondant/gumpaste with raw sugar as the sand. I just love the way the sun umbrella turned out, perfectly ruffled. 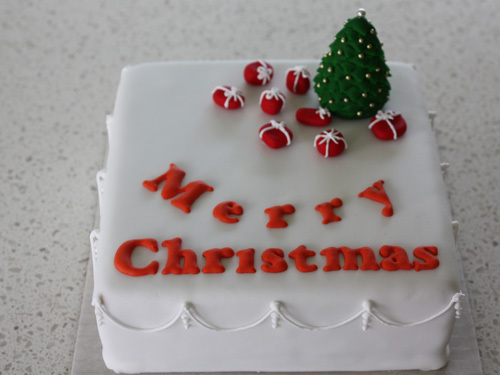 Here are the cakes I made for family this christmas. For the two square ones I tried a different method for the lettering. I used royal icing but piped the letters out on parchment then when dry transferred them to the cake. I did a couple of sets which was good as i did break a few so was pleased to have some back ups. I think I like doing the rectangle shaped cake for fruit cakes. 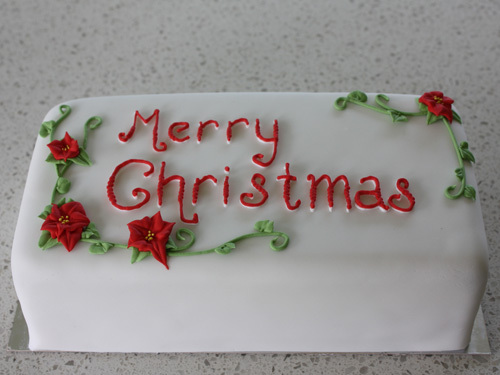 This time I tried a piping the lettering directly on the cake using two layers white on the bottom and a wriggly red top layer. 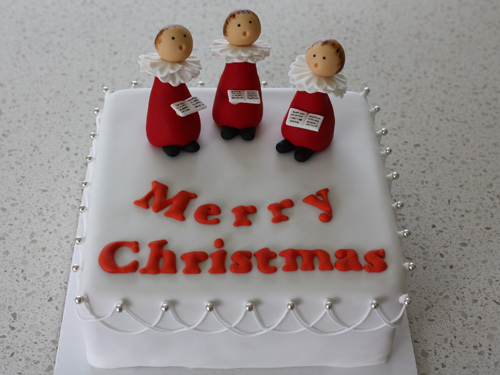 The poinsettia flowers were all piped royal icing. This cake was for a two year old who was having his party at the zoo. The giraffe and zebra were made from gumpaste. The cake is my favorite chocolate cake with chocolate ganache filling covered with fondant icing. 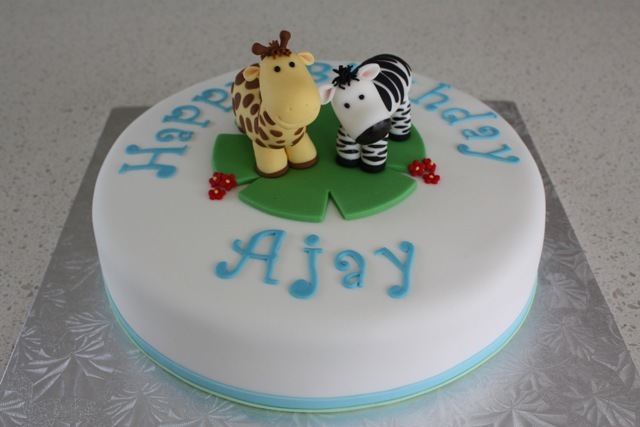 Happy Birthday Ajay, hope you have a great birthday party! It has been ages since I’ve posted anything. That’s due to my kitchen being ripped out and new bigger and better one going in. It’s great to have so much space to work in, not to mention fabulous appliances! Here’s the first decorated cake from the new kitchen. A barbie cake for my neice Leeza’s birthday. 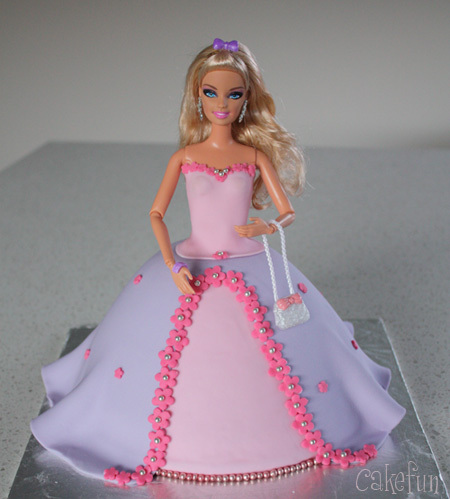 I didn’t have a special cake barbie so it just a regular one minus the legs (sorry Barbie, lucky they clip back on).